What IS it with cats and baskets? Our cat Nala ignores all furniture, rarely sits on anything that isn't fabric and is largely uninterested in anything designed to be a cat toy. But if I leave the laundry basket unattended for more than a few minutes and BAM!, she is in it. Of course, it seems there is an added bonus if there are still freshly-laundered clothes in it. 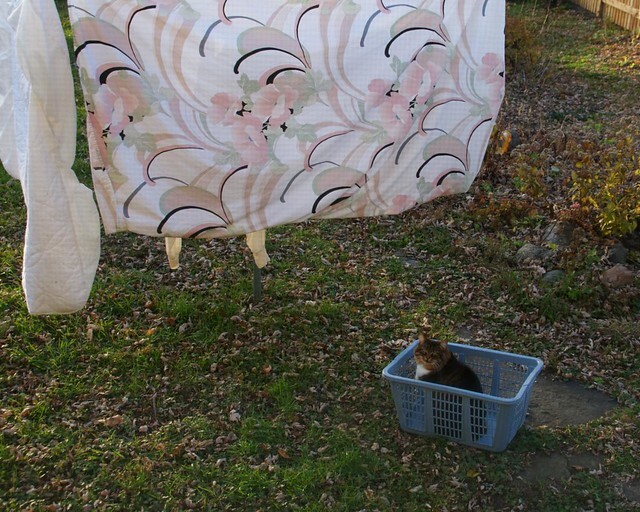 In this case, I had just done a load of sheets and mattress pad and used the basket to carry the damp sheets outside to hang on the line (you know, that free clothes dryer that is banned in many neighborhoods) leaving the basket there for retrieving them later. When I let Nala out it never occurred to me that she would pay any attention to it. There are mice to hunt! She went right to it, jumped in, and sat there stately overseeing her domain for about 20 minutes. No wonder 44.8 percent of the total traffic on the internet is dedicated to funny cat videos.